Lights, camera, action! This exclusive formula extends makeup wear by preventing cracking, smudging, fading, or creasing. Works with any makeup and all skin types, plus it has aloe to hydrate your skin. One-step, perfect! Ingredients: Talc, Silica, Boron Nitride, Nylon-12, Synthetic Fluorphlogopite, Caprylic/Capric Triglyceride, Polysorbate 80, Kaolin, Cyclopentasiloxane, Lauroyl Lysine, Dimethicone, Trimethylsiloxysilicate, Phenoxyethanol, Polybutene, Caprylyl Glycol, Dimethicone Crosspolymer, Xanthan Gum, Hexylene Glycol, Ethylhexylglycerin, Water/Eau, o-Cymen-5-ol, Dimethicone/Vinyl Dimethicone Crosspolymer, Tin Oxide, Dimethiconol, Methicone, Mica, Iron Oxides/CI 77491, CI 77492, CI 77499, Titanium Dioxide/CI 77891. Shake well. Apply after your makeup routine. 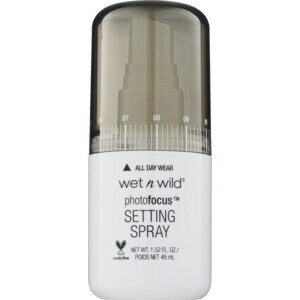 Hold the PhotoFocus setting spray 8 in. away from your face and mist in a criss-cross pattern. For external use only. Do not consume. Keep out of reach of children.